You might consider yourself loyal. Your supplier might think you’re lazy. Either way, we reckon you’re getting ripped off. Be prepared to get very angry with your energy supplier. And then to get even. Most people think loyalty should be rewarded. But somehow the executives of Britain’s energy suppliers didn’t get the memo. In fact, the Competition and Markets Authority have today revealed that if you stick with your supplier for years, you will find yourself on one of the worst deals in the land. So how many of us count as ‘loyal’ and are therefore getting fleeced? In fact, 60% of British households have never switched. Millions of people are still with the same supplier that inherited their meter when the energy market was deregulated at the turn of the century. And these people are doing especially badly. We’ve shared a Little Map of Rip Offs, just below. It’s a mosaic of the old regional monopolies that are now in the hands of the BIg Six. Find where you live, then check which of the Big Six inherited the monopoly in that region. 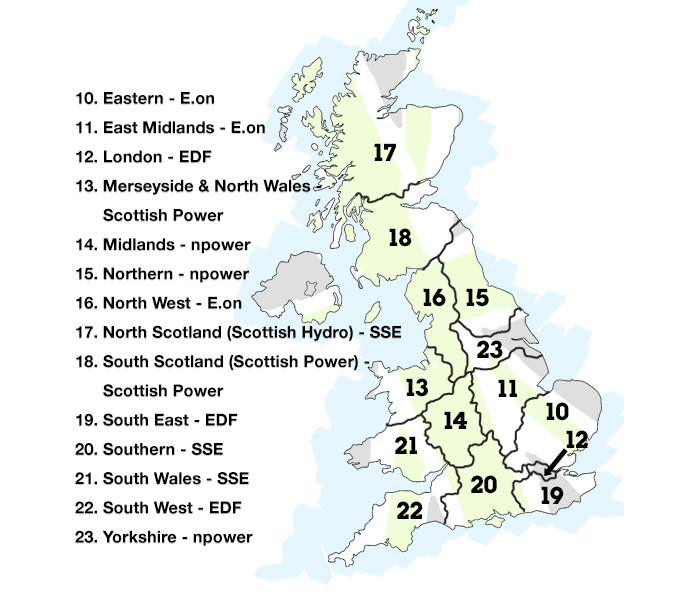 For example in London, it’s EDF. For Berkshire, SSE. If you are with that supplier, you are probably on one of the worst deals in the country. Imagine you’re at your mum’s house. You mention that switching energy supplier could save her a few pennies. A loyal customer is EXACTLY the kind of person they’d charge over the odds. You see, energy suppliers charge lots of different rates to lots of different customers. Er, that’s your mum. The loyal customer. And if you haven’t switched your supplier for a few years, that’s you getting ripped off too. They’ve charged you all kinds of prices and you didn’t switch. So they figure you never will. Let’s put an end to this. You’ll be amazed (and angry) at how much you will save from leaving your current supplier. Sign up below to hear about our next deal!